Why is Microsoft Dynamics GP better than Peachtree? As an entry-level accounting package designed for smaller businesses, Peachtree offers a limited set of features and basic database functionality that ensure ease of use and a modest price. The drawback is that as your company grows, it will eventually outgrow the database limits and feature set offered by Peachtree. Having to implement manual workaround procedures or purchase third-party applications in order to get your work done. A noticeable decrease in performance, including delays in the loading of menus and screens in Peachtree. The number of users needing access to your accounting system exceeds Peachtree’s maximum number of users. Reports take an unacceptably long time to print. Finding an increasing number of much needed features lacking in Peachtree. More than just accounting software, Dynamics GP offers over 1300 more features than Peachtree (2,550 compared to 1,140). These features span key areas of functionality, including financial management, business intelligence and reporting. Peachtree’s database performance can begin to decline after as few as 75,000 transactions. Dynamics GP offers a far more robust database that can handle millions of transactions with no noticeable lag in performance. With over 50 modules available out of the box (compared to Peachtree’s 18 modules), Dynamics GP offers a greater degree of customization to meet a diverse range of business needs. 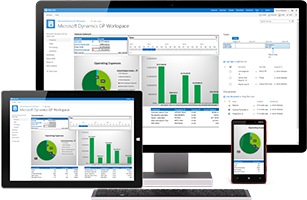 Dynamics GP modules enable advanced distribution, manufacturing, supply chain management, field service, human resources, project accounting, business intelligence, and workplace collaboration functionality. The whole point of an accounting software solution is comprehensive and actionable financial reporting. Microsoft Dynamics GP offers over 700 standard reports – nearly five times more than Peachtree’s 143 standard reports. In addition, Dynamics GP’s advanced reporting tools allow users to customize and schedule reports to be printed automatically at pre-determined intervals and delivered to the appropriate recipients via e-mail or publishing to the company’s business portal web site. Dynamics GP offers a web browser solution called the Business Portal that negates the need for complicated setup of user desktops. Regardless of where your users are or what device they are on, the Business Portal provides them with secure, encrypted access to your Dynamics GP environment from any location in the world. Has Your Business Outgrown Peachtree? 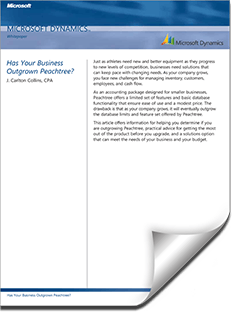 Learn how to identify the signs that your business has outgrown its Peachtree solution and find out how Dynamics GP can help you to grow your business.